The Duke and Duchess of Cambridge and Prince George are pictured in the garden. Welcome to Kensington Palace! Later this week, new parents Kate Middleton and Prince William are expected to move into Apartment 1A, Today reports. Previously based in Anglesey, Wales, the royal couple--and son Prince George, of course--will relocate to London. 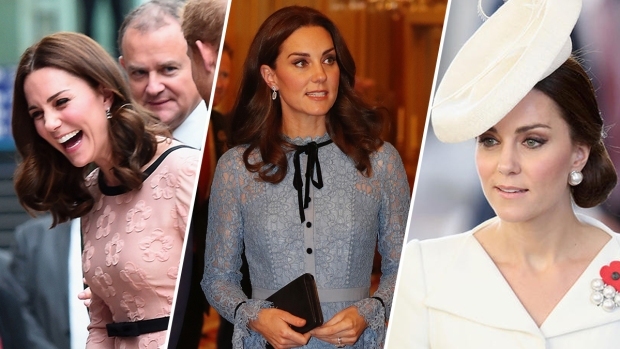 The Duke and Duchess of Cambridge will reside in the four-story, 20-room abode that once belonged to the late Princess Margaret, who died in 2002. "They can't wait," a friend of the royal couple told The Express. "They are so looking forward to getting the place how they want it and being settled." NEWS: Prince George's christening gets a date! Apartment 1-A features five reception rooms, three main bedrooms, dressing rooms and bathrooms, a night and day nursery, staff bedrooms and "ancillary rooms," according to the paper. Asked about the royal family's move, a Kensington Palace spokesman said, "It'll be soon, certainly. I can't say exactly when--builders are builders." Around $1.52 million of taxpayers' money was used to renovate Apartment 1-A. Contractors replaced old wiring, repaired the Clock Tower wing roof and removed asbestos. The royal family will cover the decorating costs themselves. Middleton, 31, is said to be heavily involved in the redesign. She even reportedly asked Australia's Princess Mary for design tips. "Mary showed them around their apartment at the Amelienborg Palace and they loved the way they had combined their collection of modern art with antique furniture," a palace insider told The Express. "Kate was truly inspired and wants to use some similar ideas in some of the rooms at Kensington Palace."